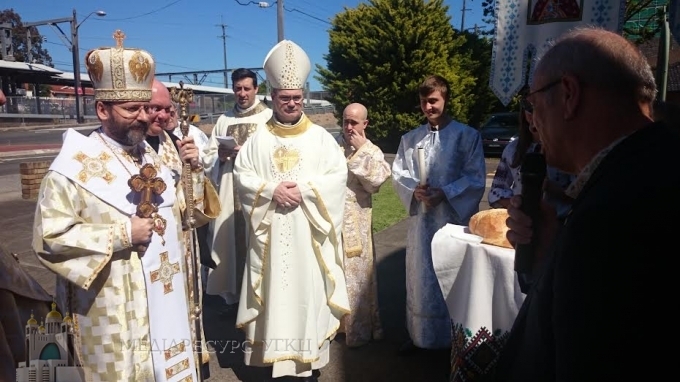 His Beatitude Sviatoslav in Sydney: "We are called to renounce the false ideas about what Ukraine should be"
Take your cross onto your shoulders – it means to go that life way, that Jesus Christ calls us to Him. Do not look for other ways. Do not be jealous of the neighbour; do not think that someone lives easier than me, but to go on that road, which the Lord God calls me, with all its hardships and joys. 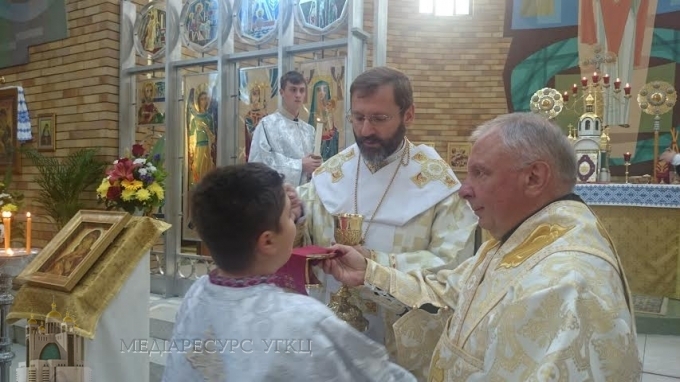 It was told on this day, September 28, during the Hierarchical Divine Liturgy by the Father and the Head of the Ukrainian Greek Catholic Church, His Beatitude Sviatoslav (Shevchuk) in the church of St. Andrew in Sydney. With Him coserved the Bishop Peter Comensoli, the Apostolic Administrator of the Sydney archdiocese, and the vice-rector of the seminary "Good Shepherd" RCC Arthur Givney. Also the numerous seminarians of "Good Shepherd" came to pray. The Preacher explained the faithful what the word of Jesus Christ mean "disclaim yourself and follow me". "Disclaim yourself means to deny your false ideas about own benefit and to accept the truth in all its fullness, take the cross onto your shoulders. And to follow Christ means not to stop on this road. Do not stand with this cross, but go forward. The words of the cross of Christ and about the rules of Christian life in a special way sound to us, Ukrainians and for Ukraine in a whole", - pointed out the Primate. "We are perhaps called today- He said - to disclaim false ideas about what is or should be Ukraine". His Beatitude recalled the words of His Holiness Pope Francis on the canonization of John XXIII and John Paul II: they had the courage to contemplate the wounds of the crucified Christ during the World War II. "Today, - says the Head of the UGCC – they crucify the Christ in the body of our Church, shooting at us. If we stop now, pity ourselves and cry over our wounds, we will not see a new life and resurrection". "So the Christ says to us today: do not be sad and do not cry”. Take the cross and follow me into the life"- asks to think His Beatitude. He encouraged the Ukrainians, the faithful of our Church who live in Australia, "not to be ashamed of crucified Christ". "If you are looking for the way to keep the entire legacy that your parents brought to the holy land of Australia, remember that without the God’s Cross there is no future. Because just through Him comes the resurrection"- stressed the Preacher to the Australian Ukrainians. "I beg you: Love your church, use of its spiritual power, do not look for any spiritual services in other Churches. Because the Church of Christ - it is something much more than human cultural organization that preserves some national heritage. Church keeps the source of eternal life, constant inspiration, strength and resurrection. Today we pray for our Lord to give peace for the Ukrainian land; by the wounds of our soldiers, volunteers, through the blood that was shed on Maidan, to give in due time the resurrection, peace, freedom and independence of our country, "- stressed the Head of the Church. 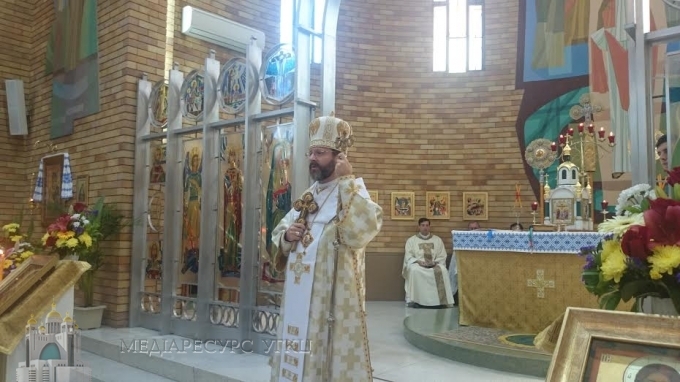 His Beatitude Sviatoslav thanked the Bishop Petro (Stasyuk), Diocesan of Australia, New Zealand and Oceania for organizing His pastoral visit to Australia. Also thanked for the fact that Bishop Petro accompanied him in various Australian cities. The Head of the Church marked the Bishop’s "fruit of labor". Also, the Head of the UGCC thanked the prior of St. Andrew’s Cathedral Fr. Symon Ts’kuy, who also accompanied him throughout the trip in Australia. But special thanks from the Head of the Church were for the faithful of the Church, which are numerically filled the church of St. Andrew. To the liturgy the faithful came from parishes of Newcastle and Vollon Gong which His Beatitude could not attend because of the lack of the time. The Head of the Church presented to the Cathedral of St. Andrew, like other churches, which He visited in Australia, Antimins in the memory of His visit. It is worth noting that the church of St. Andrew was built in 1962. There is an active Ukrainian parish school, kindergarten, which is carried out by Basilians sisters; there are various encouraging groups for the youth.